10 x 10 Truss components are constructed of square, triangular, or flat pieces. 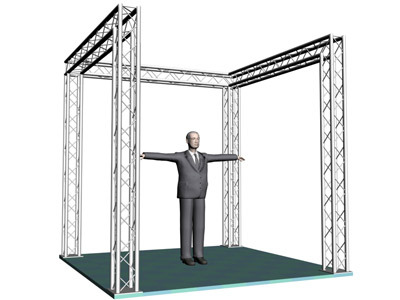 Exhibit and Display Truss offers three different truss profiles, 10 inch, 12 inch, and 6 inch display trusses. 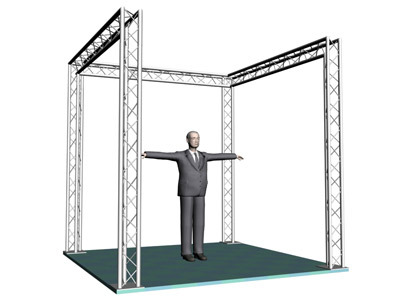 All of our truss structures are designed for ease of assembly and available in a number of designs and sizes. Our truss systems are constructed of durable, high-strength aluminum and steel for supporting LCD or plasma screens, graphics, lights and other accessories. This 10 inch 4 chord display truss provides a solid truss base which provides a trade show booth that can handle a large sign or banner. 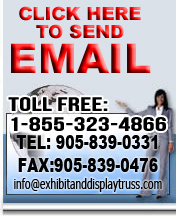 For those of you who have come to Exhibit and Display Truss and would would like some more information on trade show booths, you may want to visit our beginners truss guide - What is an exhibit display booth? Our 3 chord 10 x 10 10 inch profile system provides a manageable structure which has a lighter truss design which still offers great stability. Our Exhibit and Display Truss catalog includes accessories for truss components, truss parts, junctions, swivels, and available chord types to add on to your truss system or custom truss design. View our truss catalog.